The V-Force has 30 years of experience in designing and making weighted vests that are meant for training purposes and beyond. In their years of experience, they have made some of the most versatile heavy weighted vests in the world. The V force weight vest is perfect for anyone and everyone passionate about fitness. This vest allows you to train in comfort. It is built to withstand the stress of some of the toughest military training and assessments. Over 500 fire departments use this model for their Candidate Physical Ability Test. Because of using only the best of the top military grade materials, it is guaranteed that you will enjoy working out with this vest. It is undeniably durable and is said to last a whole lifetime. V force weight vest even has a lifetime warranty that comes with the vest. With a wide range of sizes and styles available, you can train in style and comfort as well. There is a multi-layer of pockets on the vest that gives you maximum weight support during your strenuous training sessions. The 2-piece design is perfect for anyone who does not like to deal with complicated straps, buckles or whatnots to adjust the weight of the vest. This model has a simple 50lb base weighted vest and a 25lb attachment. It probably cannot get any much easier than this! The straps on this vest are of just the right size. They are not too small to make it uncomfortable when carrying heavier weights and, yet not too large to restrict one’s movements either. Having thick padding on the vest just makes it all the more comfortable to train with it, as the pressure is spread evenly. Another plus point of a fully padded vest is that it will fit very well against the body. 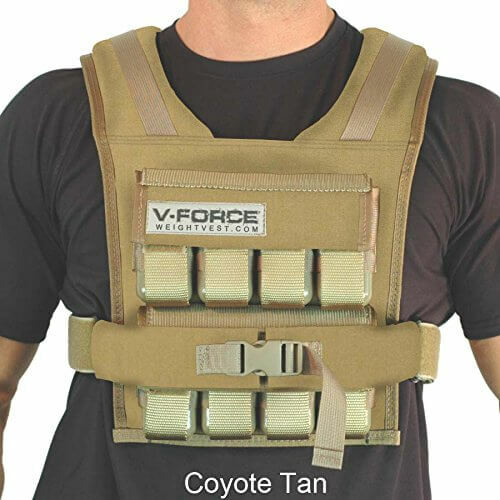 The v force weight vest is a unique gear that is made of the most durable materials. If three layers of nylon are insufficient for you, fret not for the vest has reinforced stitching as well. The vest is resistant to moisture, which is perfect when people use it for training purposes. Sweat is a byproduct of training hard, and having a vest that is resistant to it makes it easier to clean it after a training session. The weights can be attached to and removed from the vest. This removable weight feature makes easier for you to customize your vest to suit to the particular weight that is suitable for your fitness training. The weight pockets are at the front and back of the vest. This pocket feature makes it possible for you to distribute the weights as you wish; according to what body part you want to train specifically as well. This one size fits feature makes it easier for everyone to use, especially me. Though some may be hesitant towards this statement if he/she has an unusual body shape. However, with only one size to choose from, you never need to worry about purchasing the size that is big or small for you. You only need to make a choice between the narrow shoulders or wide shoulders model, which depends on more on How you will be using this vest for. Is the product washable by machine? No, but it is simple to clean the vest. After your workout, just use a damp cloth to wipe the vest. Feel free to use Febreeze, soap water or whatever soap you have. Simply allow your vest to air dry after the little wipe. Based on the shoulder size, how do I know which model will work for me? The smaller size is more suited for activities that require you to move your arms more vigorously. The larger sized model may limit your movements or make it uncomfortable when you do so. However, the larger size is better for activities like running. There are 3 rows of 5 on the front and back of the vest. This vest is a very comfortable fit and works well for workouts. It is a great plus point that this product is very versatile. Not only are you able to adjust the weight of the vest very quickly, but you can also position the weights based on what your training session requires. Not only will the preparation time before you workout be shortened, but the cleaning of the vest is also so easy that it does not add much trouble to your training at all. It is most likely not the cheapest short weighted vest on the market, but the vest will be worth your every penny.